Do you think that will happen? I do not think it will happen either. However, that is exactly what a Person Injury Attorney does. At Pepper & Odom Law Firm, we take your case and we only get paid if we collect money for you. In short, we bear all of the risk while you bear none. Do you know of anyone else that would do that for you? Trials are stressful on all parties. 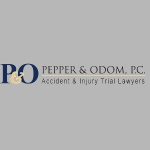 At Pepper & Odom, we do our best to help you understand what is taking place each step of the way. Opening statements, as I described previously, are simply telling your story to the jury, and once they are over, the Personal Injury Attorney starts his case in chief. Presenting his case in chief requires the Personal Injury Attorney to call witnesses to testify about the plaintiff’s injuries and how those injuries occurred by the defendant’s negligence. The greatest asset that the Personal Injury Attorney has in his possession is his client, the Plaintiff. Calling the Plaintiff to testify about his/her injuries, the negligence of the Defendant and what it is like living with those injuries has proven time and again to be invaluable to the Personal Injury Attorney. Questions on direct examination are like the following: What happened on July 31, 2016? Where were you driving on that date? Who was riding with you? This questioning of witnesses goes back and forth until all witnesses have been called and questioned. At that time, the Plaintiff will rest and the Defendant will call their own witnesses trying to prove their case. This happens in every Personal Injury Trial.